The Nigeria Police, on Saturday, announced that it will declare Mr. Dino Melaye and one Mr. Mohammed Audu wanted if they fail to comply with criminal summon issued on them by the Federal High Court, Lokoja. Mr Melaye, the senator representing Kogi West Senatorial District, and Mr Audu are to appear on 28 March to answer to criminal charges of conspiracy and unlawful possession of prohibited firearms. The summon was issued following the refusal of the two men to be in court on 20 March when the trial was scheduled to start. The Police made the announcement in a statement signed by Mr. Jimoh Moshood, Force Public Relations Officer. The Police, said the statement, will obtain warrant of arrest for the arrest of the two men and will declare them wanted throughout the country and on the Interpol platform for them to be arrested in any country they are seen and handed over to the Nigeria Police Force. The Force noted that despite the letter sent to the Senate President for Mr. Melaye’s invitation, the senator has refused to appear in court and has also evaded the service of criminal summon on him to appear before the Federal High Court, Lokoja. 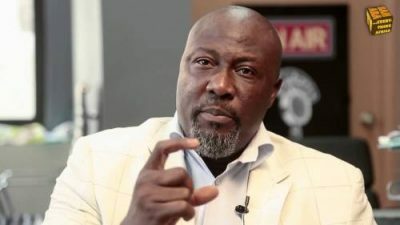 “The Nigeria Police Force is, therefore, using this medium to advise Senator Dino Melaye and Mohammed Audu in their interest to comply with the order of the court and appear on 28 March before Federal High Court, Lokoja to answer to the criminal charges against them,” said the statement. It added that the Kogi State Police Command and operatives of the Federal Special Anti-Robbery Squad trailed and arrested two suspects, Kabiru Saidu alias Osama and Nuhu Salisu alias Small after a gun battle at Ogojueje in Dekina Local Government Area of Kogi State on 19 January. During investigation, claimed the Police, the suspects admitted involvement in kidnappings and robberies, murders and other violent crimes in Kogi State, reasons for which they had been on the Police wanted list of the Police for over two years. Saidu, the gang leader, alleged the Police, also admitted that his gang had worked as political thugs for Mr. Audu, who invited him to Abuja for an introduction to Mr. Melaye in December. The gang leader also told the Police that Mr. Melaye gave him a bag containing one AK47 rifle, two Pump Action guns and the sum of N430,000 to share with his boys. The Police maintained that their investigation show that Messrs Melaye and Audu have a case to answer. Consequent upon the confessions of the suspects, who were paraded by the Kogi State Police on 19 March, the Police sent a letter of investigation activities/invitation to the Senate President, requesting him to release Mr. Melaye to report to the Kogi State Commissioner of Police. This, explained the Force, is to enable its team carryout a discreet and thorough investigation into the case. However, Mr. Melaye refused to honour the invitation.